Most of the time, we are based on a reductive view to understand the world, which breaks down everything into its constituent parts in seeking how they work specifically. However, ancient Chinese worldview is very different, that things are interdependent and mutually interactive, and should be analyzed and interpreted with reference to the whole. Yin yang and five elements were created by the ancient Chinese to express how they viewed the world holistically. Yin and yang represent two opposite yet complementary aspects of objects, in which they interact with each other to maintain a dynamic balance. The ancient Chinese used the interrelationship between yin and yang to explain the phenomena in the body as well as the natural world. In traditional Chinese medicine (TCM), yin yang theory forms a foundation of TCM holistic healing, physicians use it to explain the body's structure, physiological functions, pathological changes, and also guide clinical diagnosis and treatment. TCM views the human body as an organic unity. The sense of unity is based on the opposing yet complementary manner like yin and yang. 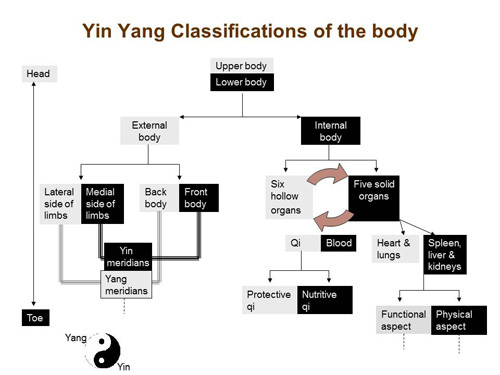 The body's organs and tissues are classified into yin and yang aspects based on their functions or locations, so that physicians can gain a closer look at the connections or interactions between different components of the body. For example, upper body versus lower body, body surface versus inter body, artery versus vein, structure versus function, absorption versus excretion, expiration versus inspiration, relaxation versus contraction, sensory system versus motor system and so on. The paired aspects are mutually controlled and interacted with each other, if one is dominant over the other part, trouble will arise.